LAHORE: (Friday, September 29, 2017): Punjab University and Punjab Commission on the Status of Women (PCSW) have signed a memorandum of understanding to increase awareness of women’s rights and engage students in research efforts about women related issues. 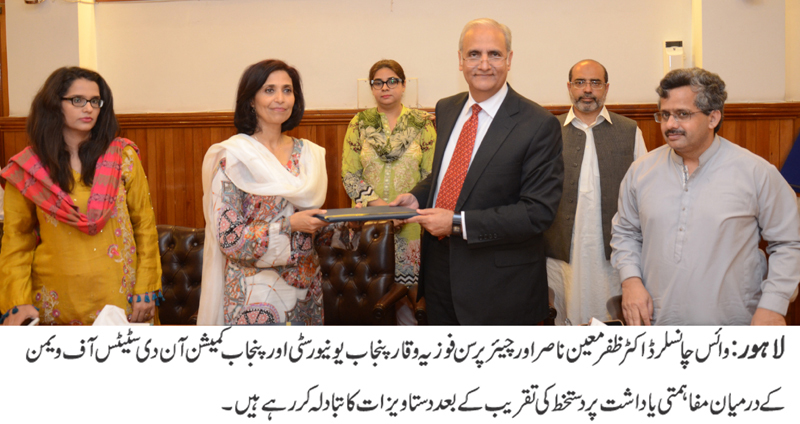 In this regard, an MoU signing ceremony was organized at committee room of Vice Chancellor’s office in which PU Vice Chancellor Prof Dr Zafar Moeen Nasir, PCSW Chairperson Fauzia Viqar, Dean Faculty of Behavioral and Social Sciences Prof Dr Zakria Zakir, Registrar Dr Muhammad Khalid Khan, Dr Rubina Zakar, Director External Linkages Dr Fauzia Hadi Ali were present on the occasion. According to MoU, both the parties would make joint efforts to raise awareness of women related laws, policies, services and recognize the role of women as agents of change in society. PU VC Dr Zafar Moeen Nasir said that efforts must be made to empower women in our society and protect their rights. He said that discrimination on the basis of gender must be eliminated. Prof Dr Zakria Zakar said that under the MoU, students would be familiarized with the use of data available with PCSW and research findings as a repository for further student-led research on women issues. He said that PU students would be engaged in PCSW’s events, advocacy efforts, social media campaigns and other initiatives. Ms Fauzia Viqar said that both the parties were aligned with the objective of increasing awareness of women’s rights and the promotion of women’s empowerment through research. She said that another aim of this collaboration was the increasing use of PCSW research amongst university students and faculty. She said that PCSW would conduct six seminars in PU per academic year.